SPW053549 SCOTLAND (1937). 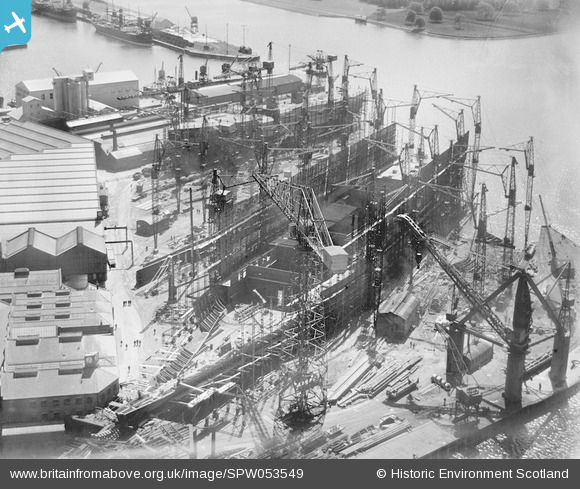 John Brown's Shipyard, Clydebank, Queen Elizabeth under construction. An oblique aerial photograph taken facing south. This image has been produced from a damaged print. Title [SPW053549] John Brown's Shipyard, Clydebank, Queen Elizabeth under construction. An oblique aerial photograph taken facing south. This image has been produced from a damaged print. Clyde Cement Works: a clinker grinding plant operated by Tunnel 1933-1967. The clinker mainly came by sea from West Thurrock.